Artist Joseph LaMarque has been creating since he was a child. He studied painting, drawing and photography at Forest Park Community College and Florissant Valley Community College. He has studied under masterwood carver, Paul Ozifo and is currently studying under Sculptor Archie St. Clair. Joseph has exhibited his work both locally and nationally. In 2014, he participated in the 250 year celebration of the founding of St Louis sponsored by Salon 55. "Lady by the Gate" by Joeseph Lamarque. Acrylic. 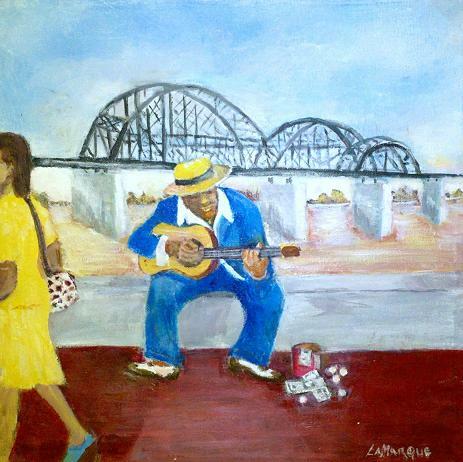 "St Lou Woman" by Joseph LaMarque. Mixed Media. "Music Man" by Joseph LaMarque. Acrylic.